Hey friends! 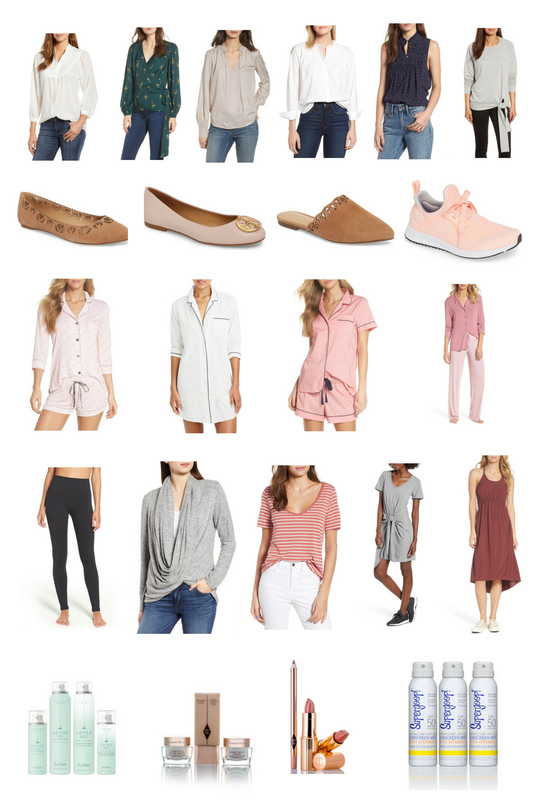 Welcome to my round up of all things Her, Him and Baby for the 2018 Nordstrom Anniversary Sale. I'll admit that I find this year's women's selection to be a bit lackluster and a lot predictable but I think the Baby section and the Home Decor line up is out of this world. Snag the Dock A Tot (I know of second hand Docks that have sold for more than the sale price in online resale groups), Maxi Cosi car seats and Halo sleep sacks for baby/toddler because I think they'll be gone on day one of Public Access. Now let's chat Fall pretties for Mama. I chose tops to add to this lineup that are classic, season-less and fit into my regular lifestyle. Gone are the days where a silk blouse does me any good so I went for pieces that a flattering on the mid section and have length appropriate for my 5'9" self. I won't lie, I'm a sucker for Tory Buch flats. They are classic, comfortable and can go anywhere. I tend to wear them all Fall and Winter here in the South where we don't truly battle the elements and have yet to regret purchasing a pair. I love the matte finish of the blush pair being offered in the Sale this year, take a peek if you're a Tory fan (also available in black). I do want to jump on the mule trend because who am I to fight a shoe trend thats comfortable and doesn't require me to bend down for buckling or tying. I'm loving the cognac brown of this pair, and the price point is friendly, too. Oh hey, we all know I love pajamas! I honestly want to order every. single. pair. in this roundup but I'll restrain myself and choose two. Or three. Perfect pieces to throw on and run errands in, I have and love the Zella High Waist Leggings (see them here) and am adding this wrap to my athliesure line up for Fall. I always take advantage of the Nordstrom sale to stock up on products that I know and love so this year I'll be restocking my fave high end dry shampoo, my newest eye cream obsession, these sweet neutral lip colors (Lindsey Regan Thorne, my personal Beauty Guru loves them, too!) and SuperGoop! sunscreen spray. Ok, the baby gear of this sale is probably the category worth getting the most excited over. 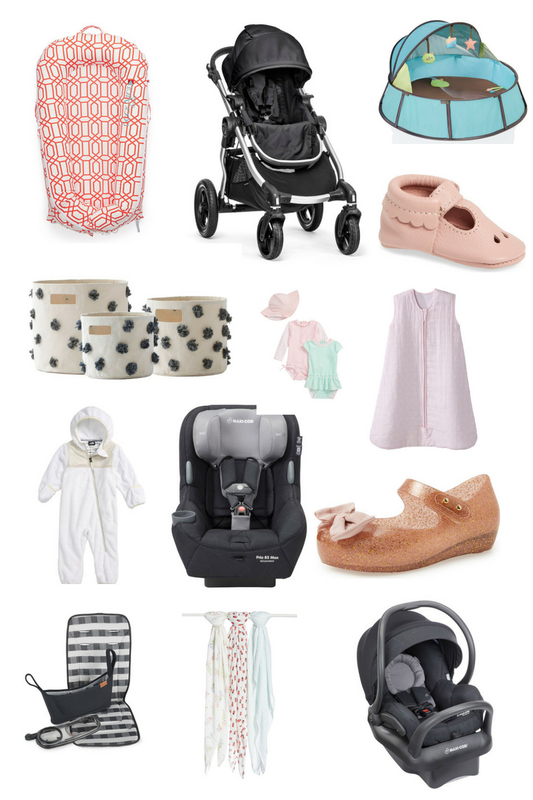 Everything on this list is something that we own and love (with the exception of the stroller caddy, that's the item on my list!) and I recommend each and every one. Both carseats are currently installed in one of our vehicles, the Dock A Tot was a game changer when Georgia was a newborn and the Mini Melissa's smell like grapes. Grapes. Enough said. Order it all. For my husband, I have my eye on a pair or two of joggers (so that he doesn't blow my cover when I wear "work out clothes" to Saturday donuts and he wears shorts and a polo), always snag him a pair of work loafers and try to talk him into new tennis shoes. The kid wears a pair of shoes until the soles fall off, so he's always in need of an upgrade. And for my sweet Boy, I find the best deals to be on outerwear and shoes. I always snag a fleece jacket, heavier coat and a pair of shoes for my growing boy. This year, I'll probably grab the Vineyard Vines pullover and polo because the quality is wonderful but the regular list price is not.